During the show, I came across the Grenada Chocolate Company and tried their chocolate. Grenada Chocolate Company’s products have won several awards at the Academy of Chocolate in the UK. My favorite was the bar with 60% chocolate and not too bitter. They do have a bar with 100% chocolate too. I also saw a leaflet (see picture below) about a documentary called “Nothing Like Chocolate“. I was keen to watch the documentary, especially, if I could find the time for it in my calendar. It was at a location (not a movie hall that I was aware of) in Tribeca. I went to the venue a few minutes before the screening time and was surprised to know that the venue was not a movie hall. It was the Jacques Torres Chocolate store and factory. There was no line of people waiting to watch the movie. The store seemed to be shutting for the evening. I asked someone behind one of the counters about where the movie was being screened. He pointed to a group of 3 – 4 people, setting up a projector and a screen in front of two 2-seater couches meant for guests / visitors to the store. The people in that area all seemed as though they were part of the movie crew or part of the Grenada Chocolate Company. I took a few tentative steps toward that group, when I heard a “Bon soir” in a friendly voice from a man in what seemed like a Chef’s white coat. He indicated that the movie was being screened there in a few minutes. It took me a few minutes to realize that the man was Jacques Torres himself!!! That was my celebrity sighting for the evening / week. You can watch the trailer of the documentary “Nothing Like Chocolate” here. Growing up in India, I did not know that different types of chocolate exist. Having spent a few years in the Western world, I have come to realize that there are different varieties of chocolate just as there are different varieties of mangoes, coffee, etc. I have read the terms “Fair trade chocolate”, but have never given enough thought to fair trade, beyond assuming that “Fair Trade” = farmers (cocoa growers) are compensated in a “fair” way (whatever that means!!). There, you know how ignorant I am about a food ingredient I claim to “Love” and find “Irresistible”. children are being sold, kept out of school and forced to work on the cocoa farms, while being treated poorly and being paid a pittance. It was eye-opening for me, that children go through so much trauma and challenges for something that we take for granted. We (rather, I) hardly give any thought to these issues when we (I) buy a chocolate bar on an impulse before heading to the cash register to pay for whatever we (I) bought at the local deli / supermarket. How many of us can get through a day / couple of days / a week without a chocolate fix? 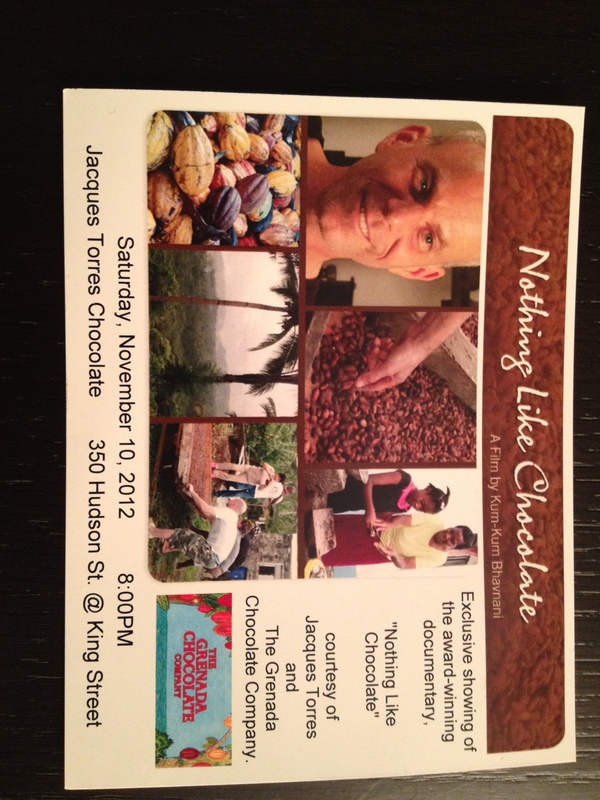 “Nothing like Chocolate” is a wonderful, eye-opening, and thought-provoking documentary about child slavery and labor, bean-to-bar chocolate manufacturing, and life in Grenada. The movie is interspersed with interview clippings of author Michael Pollan, environmental activist Vandana Shiva, Human Rights Advocate Bama Athreya, and Professor of Neurobiology David Presti at the University of California, Berkeley. Life in Grenada seems so simple – children playing cricket on the streets with plastic crates for stumps (very much like they would in India); hard-working people working on the farm, going to church, helping the community, despite their own financially tight situation. Yet I wonder, if I can voluntarily give up the comfort of living in NYC and head out to Grenada or any other tropical island for a living, or to help local farmers / population, the way Mott Green, the founder of Grenada Chocolate Company did back in the ’90s. Green is passionate about making and selling organic slave-free chocolates. He is a purist – he loves pure chocolate, hence Grenada Chocolate Company’s products are all dark chocolate without too any flavors. The only flavor / seasoning that he is comfortable including in his chocolate bars, besides vanilla, is sea salt. After the documentary screening wrapped up, Green fielded questions from the audience, although I did not stay for the entire Q & A session. Grenada Chocolate Company is not yet fair trade certified, although they are working on the certification – it is expensive. On watching the movie. I am inspired to buy fair trade and slave free chocolate as often as I can and to go on a chocolate tour of the Caribbean – most likely at the Grenada Chocolate Company or the cocoa farm at the Belmont Estate, from where Grenada Chocolate Company procures its cocoa. See the steps of manufacturing chocolate in a bean-to-bar setting from harvesting, roasting, all the way to chocolate bar production on this page. Watch this movie, if you can, and buy the chocolate bars from the Grenada Chocolate Company. I guarantee that you will certainly enjoy both. Thanks, Lakshmi!! Glad you liked reading this one. Thanks, Anuja. Am glad that you enjoyed “my” chocolate series.